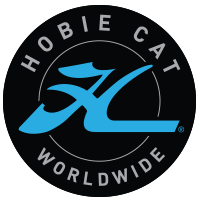 Introduced as the bigger Hobie 14, the 16 revolutionized the multihull scene when it first appeared in 1971. Forty plus years later, this boat continues to attract great sailors. Powerful enough for the world champion, yet forgiving enough for the novice, the 16 can be characterized as the Laser of the catamaran world. It’s a dual trapeze boat for two or more crew that can be sailed in strong winds. Hobie 16’s have been in production for 40 years and it is still common for find used boats on the market from the early 1970’s. As a general rule, “you get what you pay for” when shopping for a used boat. As a starting point when looking at a used boat you want to ensure it is a ‘complete boat’ with all it’s parts. Replacing major components that are missing (i.e. sails or mast) can be costly. Delamination of the hulls is the most common issue seen in very old hulls. Delamination leads to a wavy or spongy softness to the fiberglass. This is a serious problem that can lead to catestrophic hull failure if not addressed. Small areas of delamination can be repaired but a hull that has delamination over it’s entire length is generally not repairable. All wires and standing rigging should be carefully inspected and replaced if more than a few years old. If you intend to purchase a used boat to be used for racing, you will want a 320 lbs. boat. You should look for something manufactured since 1993. 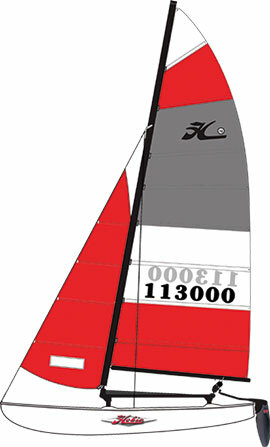 Fiberglass or carbon fiber rudders are a plus but can be obtained separately. Sail condition is a consideration. Typically the racing life of the sails is about five years but some replace their sails more frequently. The new style jib cut was introduced in 2000 and will allow you to carry more mast rake.